On New Berlin, the capitol of Rheinland, day and night each last for nearly a standard year, with the nightside of the planet being plunged into frigid, bitter winter, and the dayside a more temperate summer in which temperatures hover above the freezing point. 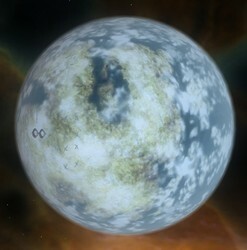 Despite this potentially hostile environment, New Berlin is very close to the abundant natural resources of the Walker Nebula and so became the first planet settled by the Rheinland people. After the economic collapse brought about by the 80-Years War with the Gas Mining Guild (GMG) and the subsequent Popular Revolution in 702 AS, New Berlin became a society of marked contrasts. As millions try to recover from years of economic mismanagement and political scandal, the black markets of Rheinland boom while the underground clubs and cabarets of New Berlin are rumored to provide anything -- for a price.